This Notebook Laptop Stand meshes Nicely with Any Decor! This Display has Two Height Adjustable Shelves! 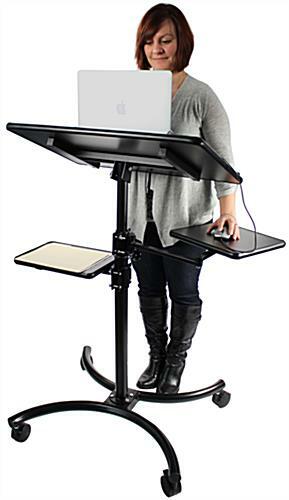 This Notebook Laptop Stand is Ideal for Trade Shows! (4) Wheels for mobility, including two locking casters. Height adjustable as high as 55" tall. 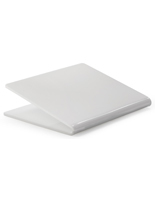 Ergonomic tilting surface for ideal presentation setup. This notebook laptop stand looks great in any setting. 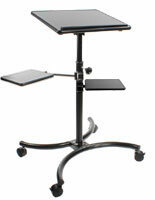 Use this mobile desk as either a work station or a lectern for presentations! 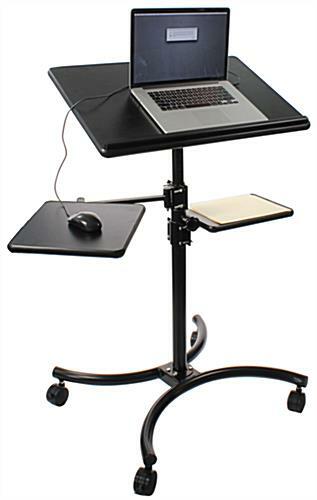 This height adjustable notebook laptop stand easily changes by unscrewing the knob on the base pole. The surface of this display also tilts to different angles, making the workstation as comfortable as possible. 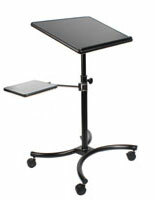 This notebook laptop stand that is mobile has two locking casters, so this display can either be rolling or stationary. The matte black finish on the MDF base and curved base will mesh with any furnishings. 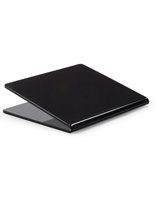 This black notebook laptop stand has a curved design on the steel base that adds an attractive appeal! This unit has (4) wheels for mobility. 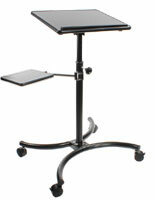 This portable computer display, notebook laptop stand has one adjustable shelf that clamps on to the base pole. This shelf has a two part extendable arm with an elbow joint, which measures 20.5" long, so users can readjust it to any position. 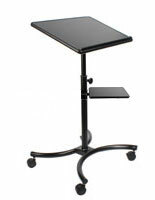 This notebook laptop stand that is for trade shows also features a second height adjustable shelf, great for storage or a presentation projector. Each of these displays is great for trade shows, residential or commercial use. This notebook laptop stand that has two shelves has a lip on the top surface to prevent items from falling off. The large 28" x 18" work space allows users to keep a portable computer and other important notes and equipment within arm's reach. This notebook laptop stand is an excellent addition to any personal office or trade show setup because of its décor and mobility.